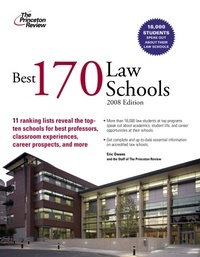 Two weeks ago, I blogged the lists of the Top 10 law schools in eleven categories posted on Princeton Review's web site in connection with its publication of the 2008 edition of Best 170 Law Schools. 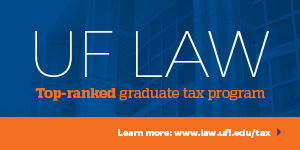 The rankings are the result of Princeton Review's survey of 18,000 students at the 170 law schools, along with school statistics provided by administrators. 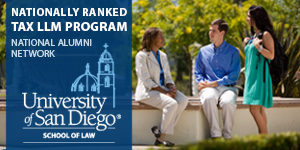 While it's always gratifying to see one's law school tied with Harvard, this ranking is entirely misleading. Law school is about all of those five factors, but it is primarily a vocational professional school at the end of which graduates expect to get jobs -- and good ones. And, in that regard, any ranking system that places ND (no matter how beloved it is to me) 21 spots ahead of Yale is highly suspect. It's interesting to note that the top 4 public law schools in the USNews study and this Princeton Review study -- Michigan, Virginia, Berkeley and UCLA -- are the same and show some of the least variance between the two reports. I suspect that reflects both the intrinsic quality of those four law schools (and the Universities with which they are associated) and the success they have had breaking through the bias towards the older private universities in these rankings generally. The substantial 'falls' of Harvard, Columbia, Yale, and Cornell should not be surprising to anyone who has worked with other than the top level of recent graduates of those law schools. It also confirms with wisdom of a law school dean who (in the late 1970s) said of rankings then available: there are really around 15 law schools that have some reasonable claim to be in someone's 'top ten' and it makes a lot more sense think in terms of the 15 or so 'top schools': this list has in common with the USNews a majority of the law schools each other's list and with most of the lists done over the past 30 odd years. Harvard, Yale, and Stanford, in particular, should be wary for their reputations over the next decade or so, and should try to return to the rigor and greatness that established their reputations. I'd simplify it all - average starting salary of first years on an hourly basis. The Bronx Taxidrivers Vocational School would do better than the top tier law schools! 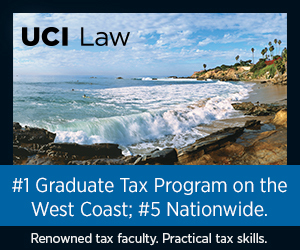 1) Permit employees to make student loan payments directly from their gross salaries (i.e. pre-tax, as with health insurance, flex spending, health savings, bus/subway fares, etc.). 2) Give a tax CREDIT (not a deduction) for the FULL AMOUNT of interest paid in a given year toward student loans - with no income cap (which is now quite low, especially for married couples with big student loans). I would just like to say that, no matter how disappointed you may, individually, feel about these results, your mommy and daddy really does love you, even if you didn't graduate from the best law school. Now why don't you all get real jobs and get off of our backs? I don't think this will keep anyone at Yale, Stanford or Harvard up at night. Like diversity jurisdiction, lesser lights have been heralding the demise of those schools for as long as they've been on top. 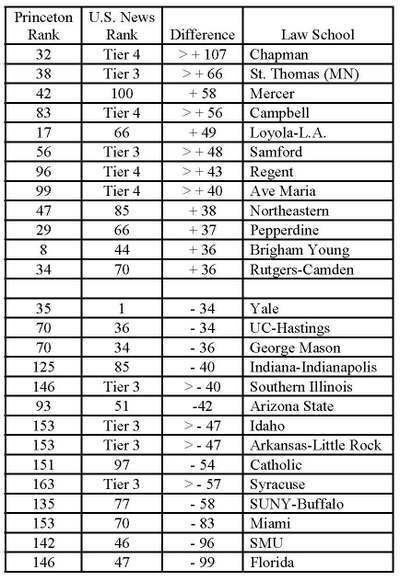 Princeton (the corporation, not the University), now joins Cooley as the author of the most suspect ranking system. Perhaps they can team up to publish the "Cool Princeton" rankings next. Rankings are the work of insecure souls dealing badly with the quiet desperation problem. But yeah, the sad fact is no list is going to be taken seriously that doesn't put Harvard and Yale at the top. And that is because Harvard and Yale are, in fact, at the top. Now, if we can somehow get a list that puts them at the top, so that it is credible to begin with, and then gradually pushes them down (below Chicago) over 10 years or so - that's the kind of list I would be a fan of. Why is "study hours" a category? That's certainly skewing the results of Harvard and Yale in particular. I understand that a "better" school may require more student work than a "worse" school, which should translate into longer homework hours. But there are all sorts of reasons for different hours. Some schools are more notorious for "competitive" students, which means they may study more than they need to. Lower-ranked schools often have students who do not read or learn as quickly, so even an "easier" curriculum from a lower-ranked school may result in longer study hours for students. At better schools, students may not feel the need to work as hard because they already have the reputation of their degree behind them, regardless of whether the final GPA is a B+ as opposed to an A-. There are simply too many variable to determine that more study hours translates into a "better" school." I am shocked how much my alma mater has dropped. Cornell is ranked below Alabama? I guess when they spit out losers like Ruth Bader and Janet Reno, it makes sense. Ah the Ohio bias. Sigh. I don't understand the whole concept of rating law schools. Period. Do we rate cockroach breeding grounds? It's all the same to most human humans. Why have you conflated admissions selectivity data with the other factors? Given that race and class play such a large role in LSAT scores, the bottom of your "Academic Experience" list perforce includes many of the schools with the highest race/class diversity, which is something many would consider a *plus*. L2L would not differ, Loyola LA is, in fact, great in all these areas-the professors are really good teachers and productive scholars,etc. His/her issue would be the fact that, in the current market, loyola's scholarly excellence does not translate into big firm jobs for most of its students (same goes for just about every other "good" school outside the top 10-15). He/she would caution against rankings such as these from misleading future students into thinking otherwise. However, again, the faculty there is stellar. It's unfortunate that that does not impact career prospects for the bottom 80% of the class. merevaudevillian: Did you read the nice blogger's criteria? Notice that the only reason Stanford is not higher up is because it's job placement score was unreported and hence was counted as the lowest possible score, a 60. I'm going to go ahead and assume that Stanford's job placement stats would give it about a 90 or higher, which would push its index to at least 385.5 (and its rank to 2). Hence, it is likely that Stanford is significantly undervalued by this ranking system and rightfully would be at or near the top. No bias towards Stanford here; I just wanted to point that out.